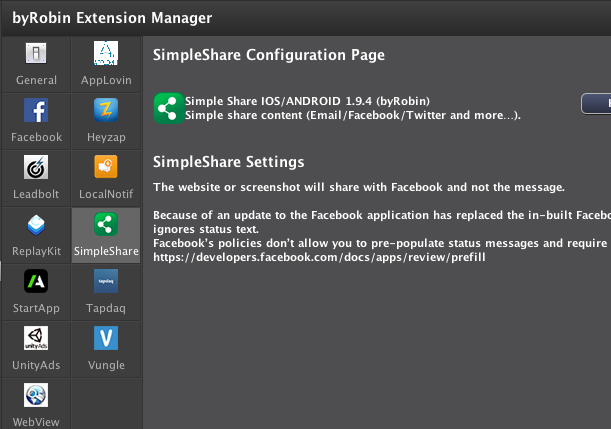 Simple Share via e-mail, Twitter, Facebook etc. HOLY CRAP I FREAKING LOVE YOU!!! This is my favorite extension now! Other then that this is awesome! I've been waiting for this for quite a long time. Most of the message is random except the hashtag, @ mention, link, and the character used. Thank you Max for you suggestions.. The reason I did this is because everyone use different share app. Instead of adding a sellected group of apps, i add them all. Not thought about this, can you gif me an excample of a message you want to share to facebook and not to twitter and vice versa. Or both? A screenshot of the game would work well for players with highscore games or similar. If I post a score to Facebook or Twitter but show no evidence of my score then did I really get a highscore? However, some games that don't use high scores could benefit from an icon or other image. I don't know if you understood me there. What I'm saying is I don't want to use AirDop, print, and so on. I just want to share a message on Twitter, Facebook, and by Text message. However, YOU might want to use Pinterest, Print, and Airdrop. So what I'm saying is give users an option to choose what service to share too instead of sharing too all. Yeah here's an example of what I'm thinking. Text Message: Booyah! I just scored 29 points in Mr Tart! Think you can beat me? I Will look in to it...... I working at another project as well. So for now enjoy this extension. Keep following this extension for updates.. Thank you for making this. It is a very important extension for Stencyl. I hope many developer will use it in the future. Hey guys, I'm facing a problem. Stencyl can't seem to compile this for some reason. Says build is done but the save part doesn't appear. But when I remove the extension, It's back to normal. Can you tell me what's wrong guys? It only works with the beta 3.3 version of Stencyl due to some internal code stuff. Is there any chance we will be able to choose the specific sharing services instead of having them all in there? Sharing via Pintrest or other similar applications doesn't work, so I'd like to be able to share just via text, tweet, and Facebook post.